PICTURED HERE Two young patients designed these emojis to help children and teens with Type 1 diabetes better communicate with their parents and caregivers. The app is currently in production for the iPhone and Android app stores. Six-year-old B* never knew he was a designer — until he created a medical intervention tool that could potentially save his life. “It’s impossible to explain to the average caregiver in just a few minutes how they should administer the EpiPen to your child for the first time and save their life,” she says. Lee and B now use this solution to explain the EpiPen instructions whenever they go to a new school or environment. Lee posted the tool and the story of its creation on her blog. Other pediatricians and health and technology experts took notice and deemed the video an effective health communications strategy. And so began Lee’s work to integrate patient-centered, participatory design and design thinking into her own practice of medicine and at the U-M.
For the last two years, Lee and a team of interdisciplinary collaborators at the U-M have been actively involved in a broad effort to promote patient-centered design, the use of emerging technologies like mobile technology and social media in health care, and the notion that patients, caregivers and the community should be involved in designing health systems, tools and technologies. This collaborative network, called HealthDesignbyUs, comprises patients, physicians, makers, artists, designers, researchers, professors, students and advocates whose goal is to create a culture of patient-driven design thinking in health care. Design thinking is “an approach that puts human needs, capabilities and behavior first then designs to accommodate those needs, capabilities and ways of behaving,” as defined by Don Norman, author of The Design of Everyday Things and influential leader in the field of design. HealthDesignbyUs is leading a variety of projects and initiatives to bring patients, caregivers and the community into the design process. Lee believes that empowering patients and caregivers to recognize themselves as experts in health and to engage them as partners in creating health tools and technologies is critical to transforming the health care system — a system that is often plagued by bad design. FROM TOP TO BOTTOM Joyce Lee designed conversation cards to help her Type 1 diabetes patients discuss their concerns during clinic visits; patients created health device prototypes during the 2014 We Make Health Fest design workshop; Jacob “Jake” Dwyer, interactive comic book artist and student at the Stamps School of Art and Design, and Trevor Torres, patient advocate and student at the University of Michigan, paired up to create an interactive electronic comic book that aims to educate children and families about diabetes management, discuss attitudes both positive and negative about health, and empower patients with Type 1 diabetes. Lee and her team are prototyping multiple ways to implement patient-centered design, in clinical settings, workshop settings and educational advisory meetings. Several efforts are underway in Lee’s own area of expertise: Type 1 diabetes. HealthDesignbyUs has been organizing and hosting workshops inviting teenagers and children with Type 1 diabetes to design tools they wish they had in managing their disease. Engaging patients in this way has led to ideas and prototypes that will improve communication between parents and their children. Examples include a mobile application that would allow children to message their caregivers with specific diabetes-related issues during school; an electronic comic book that aims to educate children and families about the ups and downs of diabetes management; and an emoji mobile application that will provide a less-stressful, more efficient way to communicate with parents about their glucose numbers. The emojis were designed by sisters Reece and Olivia Ohmer. Olivia, now 11, was diagnosed with Type 1 diabetes when she was 3 years old. Reece, now 13, watched, observed and learned about her sister’s disease and diagnosed herself with Type 1 a few years later. Students from the U-M Stamps School of Art and Design have created the visual designs based on the girls’ sketches, and the app is currently in production for the iPhone and Android app stores. The two sisters have also created a customizable form for children and teenagers with Type 1 to bring to their quarterly clinic visits. The form allows patients to jot down questions or topics they want to discuss with their doctors ahead of time so they can remember to bring them up during the visit. It’s now available online for endocrinology patients at the U-M. Reece and Olivia say they have been inspired to continue working to make a difference in Type 1 diabetes and children’s health care since the first workshop they attended with Lee. Many of the ideas developed by experts like Reece and Olivia require more funding and resources to move forward with the next phases of development. So HealthDesignbyUs also works to connect people in the health care, technology and design communities. One of the ways they do that is through the We Make Health Fest — a science fair of sorts based on the DIY “Maker Faire” movement — that launched in 2014 and encourages independent inventors and designers to become creators instead of just consumers. “We Make Health speaks to the notion that making should be part of the culture of health care, and if you can bring the patients and the caregivers and the technologists and the tinkers together, you can create some really incredible things,” Lee says. Lee and her team are also collaborating with students and faculty from the U-M School of Information and the Stamps School of Design to find experiential learning opportunities for students interested in developing a portfolio with meaningful designs that solve real problems in health care. She says it’s important to design “with members of a different tribe” to see all the possibilities. For example, Stamps launched a new project-based Master of Design in Integrative Design program this fall, and the inaugural cohort, as well as the second cohort beginning in 2016, will focus on what they are calling the “wicked problem” of 21st century health care. The program will bring together working teams of graduate design students, Medical School faculty and staff at the U-M Health System to address specific issues in health care. As they begin their work, the students will set up a studio-based inquiry to determine potential partnerships and opportunities. The first six students, chosen from 55 applicants, are coming to the U-M from all over the world, all with industry experience in various backgrounds including statistics, industrial design, environmental design, user-experience design, speech pathology, psychology and anthropology. Program director John Marshall, Ph.D., says the question that had the greatest impact during the recruitment process was when he asked the applicants to imagine what their final completed project might be and who would be standing there with them when they presented it. Nancy Benovich Gilby, the Ehrenberg Director of Entrepreneurship and adjunct clinical associate professor of information and research investigator in the U-M School of Information, has also enlisted her students to think about how their projects could be applied to issues in health care. Benovich Gilby, together with Lee and Matthew Kenyon, associate professor in the School of Art and Design, have also recently received a Transforming Learning for a Third Century Quick Wins and Discovery Grant to provide more formal curricular opportunities for students to design health technology solutions with patients and caregivers. Benovich Gilby, her students and Lee are also working with Game Start — an Ann Arbor-based company that teaches children to design and program video games — to pilot a new Type 1 diabetes education program for children ages 6-11 at U-M clinics and Mott Children’s Hospital. Using the Game Start platform, they’re developing educational games with diabetics, educators, nutritionists and social workers. They’ve been testing the video game in workshops and in U-M clinics, and Benovich Gilby’s team is getting certified to work as volunteers in the hospital to pilot it with kids at the bedside. They’ve come up with a strategy they think can help improve upon the current education tools given to patients during diagnosis and follow-up care. Diabetes education is a major issue among younger patients, as many children with diabetes are not meeting recommended blood sugar goals. Lee is also experimenting with ways to involve patients in creating agendas for health research through her work with an online “maker” community of Type 1 diabetes patients and caregivers. The NightScout Project came together when a father hacked into his son’s Continuous Glucose Monitor, or CGM, to get remote, real-time access to his son’s glucose levels via the cloud on his smartphone. He connected with other caregivers of children with diabetes through social media, sharing his computer code, and together they collaboratively developed mobile health applications — watch prototypes, Android and iPhone prototypes, and desktop applications for viewing the blood sugars. They shared their work with a Facebook Group called CGM in the Cloud, which provided the computer code and instructions to other individuals. Patients and caregivers can now build their own system that attaches an Android phone to the CGM receiver to transmit glucose readings to the internet, where any Web-connected device can view the numbers. The group now has 13,700 members with users disseminated across the globe. Lee recently reached out to the CGM in the Cloud community with an Institutional Review Board-approved survey that she hopes will inform future patient-centered research efforts. She received 650 responses within the first two days. “This is an engaged online community with great expertise in diabetes,” Lee says. “We’re trying to reach out to patients using novel technologies like social media to learn more about what types of research are of interest to them. Can we flip the model of research to be more patient-driven instead of investigator-driven? I think we can with the tools of participatory design.” Lee was just awarded a two-year engagement award from the Patient Centered Outcomes Research Institute to accomplish this goal with the CGM in the Cloud community. Lee says that although she and HealthDesignbyUs are gaining a wealth of insight from their work in the emerging field of patient-centered design, their efforts are still largely grassroots. But these activities are an important outlet for patient engagement that could lead to future innovation. Prototypes and research ideas developed during patient workshops or through student projects may not necessarily result in an NIH grant or the launch of a company a year down the line. But “it’s the fundamental activity that we all should be doing to get the creative juices flowing and to create the most innovative and effective solutions for health care,” Lee says. Perhaps B, the designer — the patient, the maker, the collaborator — said it best during a speech he gave to members of the health care community during the 2014 We Make Health Fest. 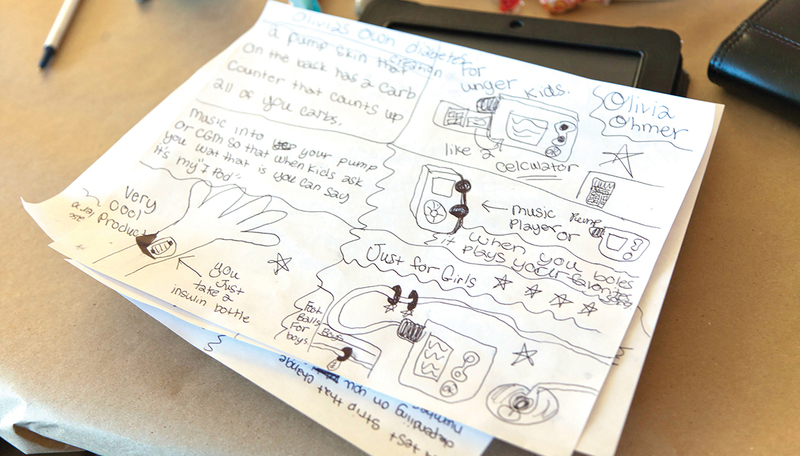 Top photo: Sketches of medical device prototypes created by patients during a Design my Diabetes Solution workshop.